With summer in full swing, studios have slowed their home video output a bit, but we still have a couple noteworthy titles this week. The best is a Jake Gyllenhaal science-fiction thriller that had a reasonably good theatrical run back in April. In 2009, director Duncan Jones delivered one of the most impressive films of the year with the intimate science-fiction drama “Moon.” For “Source Code,” he stuck with sci-fi, but he’s working on a considerably larger scale. The film not only has a bigger cast, it takes place in multiple realities. Even the lead character, U.S. Army helicopter pilot Colter Stevens (Jake Gyllenhaal), spends a good deal of time confused about what’s going on. Viewers meet him just as he wakes up on a commuter train, apparently inhabiting another man’s body. In eight minutes, that train explodes and Colter finds himself in yet another world, where people at a high-tech military facility explain that a terrorist destroyed the train hours ago and technology is allowing him to interact with the memories of the passengers. Unfortunately, he can only do this for eight minutes at a pop. Colter’s mission is to relive the moments before the explosion and attempt to discover the identity of the bomber, thus preventing future attacks. He complies, but is frustrated by the fact that his handlers won’t allow him to save the passengers on the train, in particular a beautiful woman played by Michelle Monaghan. All that remains of these people, Colter is told, is a fraction of their memories, so saving them isn’t an option. Frankly, the science is confusing and sketchy, but that’s no big deal. With movies like this, it’s generally best to allow the filmmakers their premise and go along for the ride. And a wild ride it is. Time and again, Colter is asked to relive the final moments aboard the ill-fated train, gathering as many clues as he can before it explodes. Gyllenhaal is good in the lead role and he gets nice supporting work from Monaghan, Vera Farmiga and Jeffrey Wright. The latter two play Colter’s government handlers. 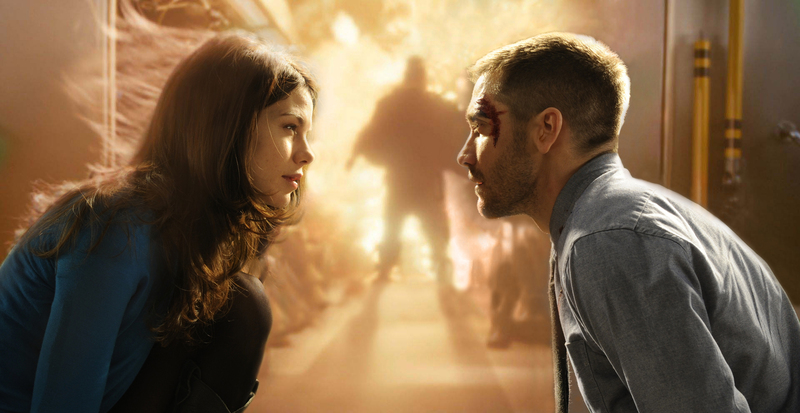 “Source Code” isn’t as brainy as “Moon,” but what it lacks in intellectualism it makes up for in pacing. The film literally starts with a bang and doesn’t slow down until the credits role. DVD and Blu-ray extras include cast interviews, a trivia track and an audio commentary with Gyllenhaal, Jones and screenwriter Ben Ripley. Director Kevin Munroe’s take on Dylan Dog, the lead character in a popular Italian comic book series, has a solid setup and quality cast but suffers from languid pacing. As portrayed in the film, Dylan (Brandon Routh) is a private investigator who can move between the worlds of the undead – vampires, zombies, werewolves, etc. – and the living. He gave up his supernatural work, however, after a personal tragedy. Then, an attractive woman named Elizabeth (Anita Briem) asks him to investigate a fatal werewolf attack. At first, Dylan refuses. But when his partner, Marcus (Sam Huntington), is also attacked by one of the undead, he is drawn into the case. “Dylan Dog” is a purposeful mix of horror and comedy, and Munroe does a nice job latching onto and promoting B movie conventions. In fact, the film is nearly pitch perfect through it’s first third, playing a lot like Joss Whedon’s excellent “Buffy the Vampire Slayer” TV series. Routh is outstanding as the handsome, brooding detective and Huntington is a kick as his loyal-but-less-adventurous sidekick. Trouble is, the pacing slowly breaks down as the movie progresses. At first, only a scene or two sputter. Then, the drudgery becomes more consistent, drawing more and more life from the story. It doesn’t help, either, that many viewers will see the movie’s big twist coming earlier than they should. “Dylan Dog” has enough positives that fans of old-school horror-comedies can embrace it as lightweight fun, but it’s not cut out for wide, mainstream success. The movie is being released on video without extra features. “Life During Wartime”: Writer-director Todd Solondz’s loose sequel to his 1998 film “Happiness.” The film focuses on three sisters (Shirley Henderson, Allison Janney and Ally Sheedy) wrestling with relationship issues and the nature of forgiveness. “Winter in Wartime”: A teen living in Nazi-occupied Holland is drawn into resistance efforts when he comes to the aid of a wounded British paratrooper. The film was directed and co-written by Martin Koolhoven, and it is presented in Dutch, English and German with subtitles. “Park Benches”: French comedy about office workers whose routine is disrupted by a mysterious banner hung on a window across from their building. The impressive cast includes Catherine Deneuve, Mathieu Almaric, Florence Muller, Chiara Mastroianni, Emmanuelle Devos and Pierre Arditi. Directed by Bruno Podalydes. “Leon Morin, Priest”: Criterion Collection release of director Jean-Pierre Melville’s 1961 drama about a French priest (Jean-Paul Belmondo) living in a small, Nazi-occupied village during World War II. Events related to the war introduce him to a local religious skeptic (Emmanuelle Riva), and their increasingly close relationship challenges both of their value systems. Presented in French with English subtitles. “Omnibus – American Profiles”: Fourteen segments of the 1950s and ’60s educational TV series. The episodes included here are focused on people and places that have had a substantial impact on American culture. Included are bits on William Faulkner, Frank Lloyd Wright, Dr. Seuss and the New York Times. “Supernatural – The Anime Series”: The live-action TV show “Supernatural” is re-imagined in Japanese anime style in this 22-episode series. Like its live-action counterpart, this version of “Supernatural” focuses on brothers Sam and Dean Winchester who try to uncover clues about their father’s disappearance while battling demonic baddies. “Dennis the Menace” – Season Two: Thirty-eight uncut episodes from the 1950s and ’60s TV series inspired by Hank Ketcham’s comic strip. Jay North, Joseph Kearns, Herbert Anderson and Gloria Henry star. “Donnie Darko” – 10th Anniversary Edition: Before Jake Gyllenhaal had completed his transition to A-list stardom, he held the title role in this 2001 thriller about a young man plagued by visions of a demonic rabbit. The film was nominated for the Grand Jury Prize at the Sundance Film Festival and it still has a loyal following. This release packs Blu-ray, DVD and digital copies of the film into a single package. After Dark Originals: Lionsgate is trotting out two new horror films as part of its After Dark series. The first, “Scream of the banshee,” is about an archeology professor (Lauren Holly) who inadvertently unleashes an ancient evil. The second, “The Task,” focuses on reality show contestants who discover that malevolent forces are working against them.